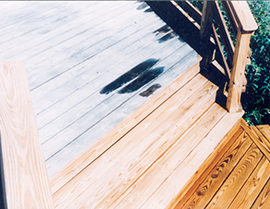 The Deck Doctors had a recent job in Hampton Virginia for a deck removal and installation. Our specialists arrived at our customer’s home to look over the structure of the deck he wanted to tear down and ways to improve the new design. The old deck was not as old as we were expecting, but the previous contractor didn’t install the tiers properly, so it lacked stability. It was sinking on the far end because the foundation was not poured properly. 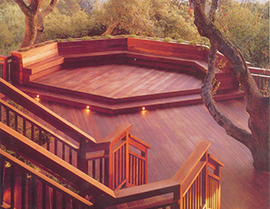 We asked the homeowner what type of deck he would like installed, and he explained that he wanted to have an excellent outdoor space that he and his family could enjoy for gatherings. We went over different styles and options in wood, then he gave us his choice of redwood. After we gave him an estimate for the complete project of removing the deck and installing a new deck, he hired us immediately. The Deck Doctors crew arrived the following day to begin the process. Once the deck was disassembled, we removed all debris from the property. We prepped the foundation, which is the first valuable step in installing a new deck. Then we placed the main beams and added the remaining wood to complete it. 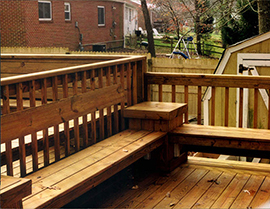 This was an attached deck that was ground-level.The homeowner loved the new installation. It looked very similar to the previous one, but built to last. 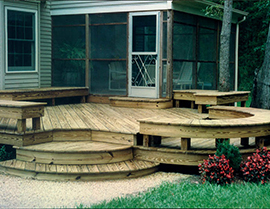 If you would like the Deck Doctors to remove an old deck at your home and install a sturdy, long-lasting one, then contact us today! 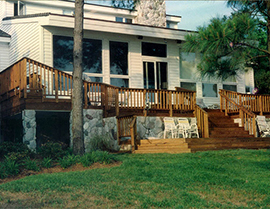 We have been providing outstanding deck solutions for Hampton, Virginia residents for nearly twenty years.